Osteopathy is a hands-on healthcare approach helping people suffering from pain and issues arising from the framework of their body, this includes their muscles, joints, bones and nerves. 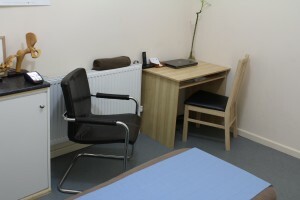 Osteopathy uses a variety of techniques usually including; massage, stretching, mobilisation and joint manipulation with home exercises to prevent re-occurrence. An osteopath aims is to treat you rather than just the condition making it a very patient centred approach. The condition you have will be diagnosed but more importantly what is causing the pain and why it has happened. Sometimes it’s an obvious sports injury but most complaints just gradually develop and without understanding the patient and considering how they use their body the root cause is often missed and a complaint can re-occur. Osteopaths can be thought of as mechanics of the body. 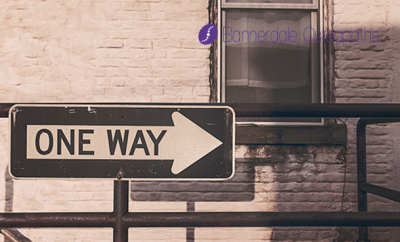 During the consultation the osteopath will listen to you and ask questions about the complaint and you to build up a good understanding of the condition in the context of you as a person. Through a detailed case history which involves your background medical history, hobbies, sports, occupation and home environment they will form some ideas about what the issue may be. The use of movements and palpation help the osteopath to confirm the diagnoses and the reasons why the complaint has developed. A large part of helping people is giving them an understanding of what is happening so we will make sure you know our thoughts on the cause and reasons for your complaint. A management plan will then be discussed which will include treatment and home exercises because moving is of vital importance, as well as education surrounding the way you use your body to get you back to health and prevent re-occurrence. Osteopaths see a variety of different people and complaints and can claim as being able to help with: generalised aches and pains, joint pains, arthritic pain, general, acute and chronic back pain, mechanical neck pain, headaches arising from neck and shoulder tension, sciatica, muscle spasms, minor sports injuries, fibromyalgia, migraine prevention, frozen shoulder, shoulder and elbow pain and rheumatic pain. 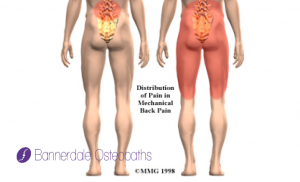 The National Institute for Health and Care Excellence (NICE) recommends osteopathy for the treatment of persistent low back pain. All osteopaths by law have to be registered with the General Osteopathic Council. The council was created following an act of parliament in 1992 to safeguard the public by regulating the profession like the General Medical Council do for doctors. 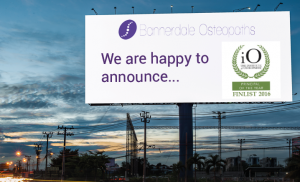 All osteopaths must adhere to strict practice standards, demonstrate evidence of at least 30 hours continual professional development every year, maintain suitable insurance and inform the council of any criminal convictions. 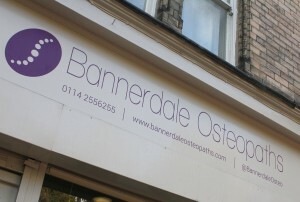 So you are assured of being in hands when you visit an osteopath. Osteopaths are primary healthcare practitioners which means they have the skill and training (at least 4 years to Masters level) to be able to diagnose conditions meaning a referral from a GP is not required. Osteopaths have good relationships with GP’s and should any blood tests or imaging be required they will usually refer through the GP into the NHS who will then fund these often expensive investigations. 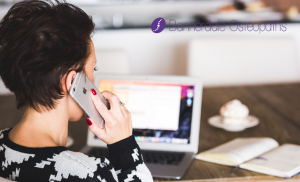 There are not many GP practices that can refer directly to an osteopath so most people have to self-pay or claim through private medical insurance which will often cover the treatments. Osteopathy was developed in the early 1900’s by Dr Andrew Taylor Still an American physician who didn’t believe the current way of treating people using often brutal surgery and toxic medication was the best way to help people. He was convinced that given the right environment the body could heal it’s self. He looked at the body as a unit that was all inter-related seeing that problems in an area could be caused by an issue elsewhere in the body. Obviously a lot has changed since its inception but osteopaths still use the principles that A.T. Still developed and look to allow the body to heal by removing the barriers to recovery.